Missguided is a well-loved British online label which burst onto the fashion scene in 2009. Drawing its inspiration from runway styles and celebrity looks, it creates must-have collections of trend-led, affordable fashion. Party dresses and exciting accessories take center stage, while wear-anywhere basics provide everything you need for a chic everyday closet. Whether it's a faux-leather mini, an elegant A-line midi or a summery boho maxi, Missguided skirts will keep you totally on-point from morning 'til night. Expect a fun, fresh collection in a range of vibrant colours, with embellishments and adornments for a luxe, cutting-edge finish. 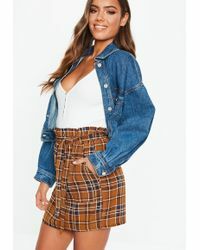 More than 4,000 results for "Missguided Skirts"